Ruben Brosbe is a fourth grade teacher in Harlem, New York City. He is passionate about social justice oriented project based learning, and finds that young people make the best activists. When he is not teaching Ruben likes to explore new neighborhoods in NYC or cook. Last week The Washington Post reported that Donald Trump had an issue with immigrants from Haiti, El Salvador, and African countries coming to the United States. You probably heard about his choice of language, so I won’t repeat it here. As usual, there was outrage and condemnation from across the political spectrum. And there should be. Donald Trump’s words are unacceptable for the President of the United States (or anyone), and they further highlight the disgrace he has brought upon the office. But let’s be clear. Donald Trump isn’t the problem. The U.S. education system is. Educators may be wringing their hands about how to address Trump’s comments in their classrooms. How do we deal with this latest embarrassment when we can’t even repeat his words in our classrooms? However, the truth is, as many have written better than I can, Donald Trump isn’t creating new ideas on racism, he’s articulating very old ones. And these racist ideas perhaps have no better incubator and transmitter than the United States education system. Think about the typical elementary classroom in the United States. Most likely the teacher is a white woman. Most likely it is segregated so that there are either little or no white kids or little or no kids of color in the room. Meanwhile, the textbooks teach mythologies such as “Africans were brought to this country as workers,” at the same time they erase the Founding Fathers’ enslavement of people like Oney Judge. The picture books available to the kids in this classroom are probably written by white women and are more likely to be about talking cars or rabbits, than Black, Latinx, Asian American, or Native American children. 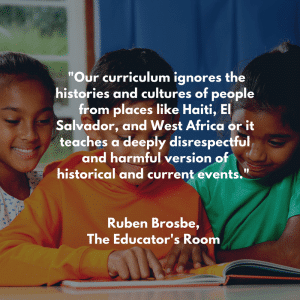 Overall, the curriculum most likely does one of two things: It ignores the histories and cultures of people from places like Haiti, El Salvador, and West Africa or it teaches a deeply disrespectful and harmful version of historical and current events. People don’t learn about the rich history of Central American, South American, and African communities. They don’t learn about their scientific and artistic contributions. Most often, they learn to think of these places as poor, dirty, and disease-ridden. It’s no wonder Donald Trump feels justified in disparaging these places, He was born, raised, and educated in the United States. It would almost be more surprising if he didn’t denigrate them! We as educators can no longer act surprised when the President of the United States exhibits racist behavior. And we can no longer act like our work is divorced from his behavior. If we are not dismantling personal biases, and biases in our curriculum and our pedagogy, then we are no different than Donald Trump. We can’t decry Donald Trump’s expletive-ridden hate out of one side of our mouth, then remain silent while our co-worker assigns racist homework. So, let’s speak up and let’s do better. There are more resources on anti-bias education than I could possibly include in this post, but I’ll offer a few places to start. Ultimately, Donald Trump is not alone in his racist, ignorant worldview. There are too many adults who share his thinking. And if we don’t intervene, there are too many children in our schools who will grow up to do the same.